And now I have a new one to add to the list: The Bomber! 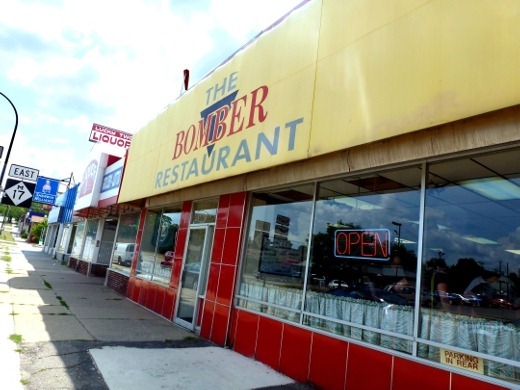 This past Sunday morning-after-The-Bang!, we went to The Bomber in Ypsi for brunch. We also had a Living Social deal to redeem. There was a line to be seated when we arrived around 11:00 AM, but we probably only had to wait about 15 minutes or so. It was pretty toasty in there, drinking hot coffee with no air conditioning on at 90+ F degree day! Booths are located along the perimeter of the restaurant interior, and the majority of the remaining seating consists of long, cafeteria style tables; however, the staff were mindful of maintaining “space” between separate parties, which I liked. 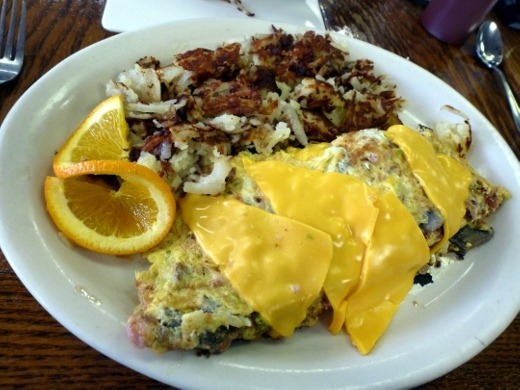 Because omelettes are one of my favorite things in the world, I ordered the Bomber Omelette. This omelette had a little bit of everything I love: four eggs, bacon, ham, sausage, onions, green peppers, mushrooms and lots of American cheese inside, and also melted on top. Uh…swoon!? 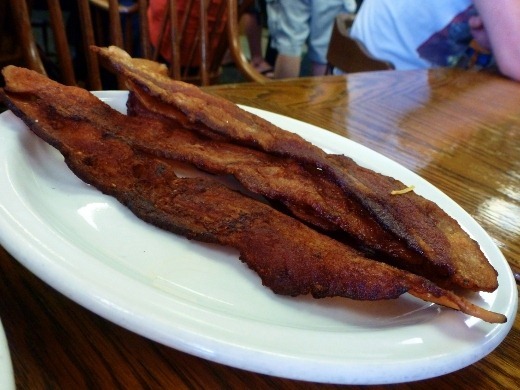 The omelette seemed as though it was initially prepared as one large, very thin “pancake” and then rolled into an omelet shape, allowing it to be cooked perfectly throughout. No burnt edges and uncooked interior in this omelette. Absolute perfection. It was awesome; one of the best omelettes I’ve had to date. The potatoes were good too – nice and crispy, and seasoned well! I also had a side of oh-sooo-buttery rye toast on the side. I could only eat half of this massive portion, and I brought the rest home for the next day’s lunch. 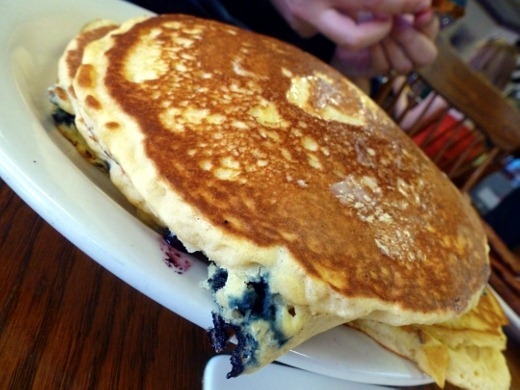 The huz ordered a full order of thick, fluffy blueberry pancakes and a side of bacon. Both were great! He, too, could only eat half of his food. This man very, very rarely has leftovers, so that is saying something! I should also mention that the prices were so reasonable, that we didn’t even spend enough to redeem the entire Living Social deal! We had $24 to spend, and even after making an effort to order the ‘more expensive’ items, were were still several dollars under that. What a deal! Overall we loved The Bomber and can’t wait to go back! ‘The Bomber’ or ‘Bomber’? Help me out, locals. I’m very sensitive to such things. Just as I demand that Sidetrack be called simply Sidetrack and NEVER “The Sidetrack” or “Sidetracks” (or even worse, “The Sidetracks” – ugh, makes me shudder), I also want to accurately name my new greasy spoon. The food was awesome, making it a great casual breakfast destination. We received fast, friendly, and accurate service as well. Later in the day, once we again worked up an appetite, the huz and I went to dinner with his brother and brother’s girlfriend (who also has an awesome name – Megan! ballin!) who are visiting from Florida. 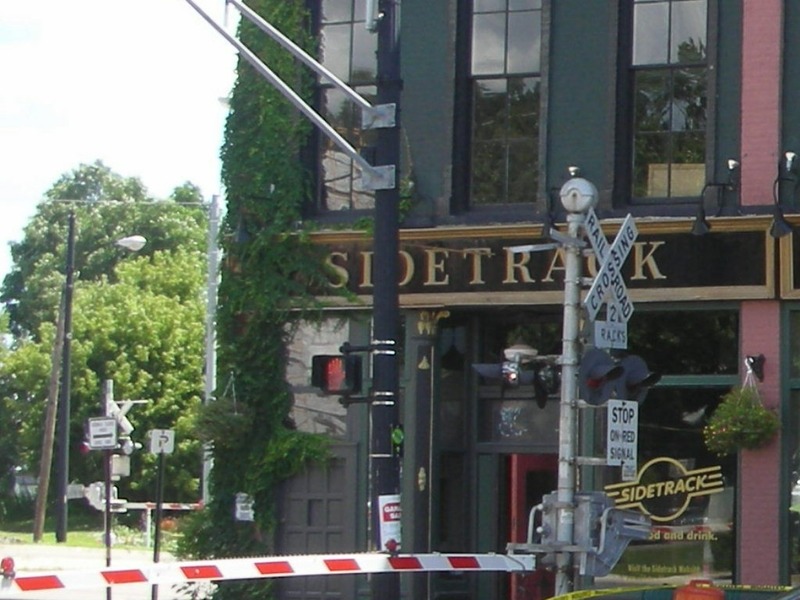 We took them to – Sidetrack! Ypsi for the win, again! We love to show visitors the huz’s BBQ Slaw Burger on the Sidetrack menu. 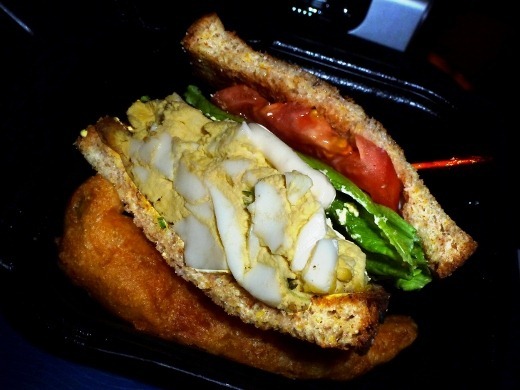 I ordered one of the specials of the day – an Egg Salad Sandwich with Sweet Potato Fries. It was good, but I prefer my egg salad a little sweeter and creamier. I loved the large pieces of hard boiled egg though. Usually when I make egg salad I mash the egg up pretty finely, but I think in the future I will keep some nice big chunks in there. The bread was also ah-may-zing. Yay Ypsi! No Bomber breakfast though? How can you turn down 35 lbs of food? 🙂 And I do confess — I do say “Sidetrack’s”. But then again I do say “Kroger’s”. Maybe it’s the southern influence, or maybe Ypsi-tucky. Pingback: The Second Bombing | Meg.Goes.Nom.Nom.